A “TV dinner” open work is when one collects separate works together and redistributes that collection, but clearly separates each work and its attribution. In this case, one is not “remixing” works, but rather curating them and offering that curation to others. Like with real TV dinners, you can still consume each ingredient by itself because they are served with clear boundaries separating each. In an open-license TV dinner, each work maintains its separate license and the collection does not need to reconcile the different licenses because each work stands alone in the collection. A “smoothie” open work is when one mixes together parts or the whole of one work with parts or wholes of other works to create a new, derivative work that includes material from many sources. Like with real smoothies, you can’t easily separate the different ingredients once they are blended together. In an open-license smoothie, one can only include works with mutually compatible open licenses and the open license of the full derivative work must be consistent with the licenses of all the included works, typically the most restrictive license. To help illustrate the metaphor I created some (admittedly slapdash) illustrations, and with some input from Creative Commons’ Cable Green and Ryan Merkley and others, have refined them a bit and offer them here for others to use to help illustrate and explain these different situations. 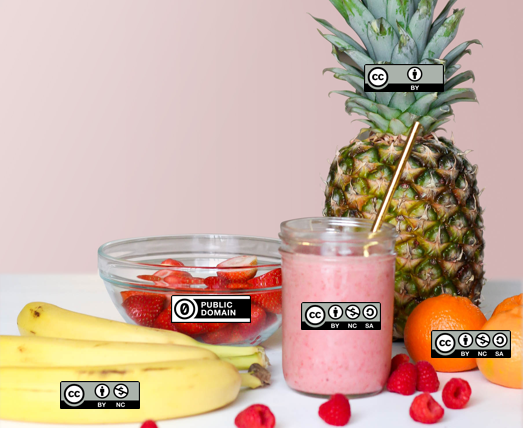 In case you were wondering and like to go meta, yes, these images are themselves smoothies, so I was careful to include only works with compatible copyright statuses and license the new derivative works with licenses that are consistent with all the works I used. With the caveat that neither I nor my blog should be a stand-in for formal legal advice: On further reflection since I first made this post, one thing to clarify is that it while it’s true one could license the tray of the TV dinner differently and without respect to the licenses of the works contained in the tray, that license would pertain only to the tray itself. So for example, if the tray contained a CC BY-NC work, one could license the tray more permissively and sell the empty tray without violating that CC BY-NC license of the work it contained, but not sell the tray with any CC BY-NC contents, even if they were properly attributed. So from my POV, including a work in the tray doesn’t create a derivative of that work (and therefore a “viral” CC SA license in the tray contents doesn’t “infect” the tray or the contents in other parts of the tray), but neither does it enable one to redistribute the tray contents in violation of any of their individual licenses. Feel free to download and retain/reuse/revise/remix/redistribute these images and/or the original Sketch file, as long as you adhere to the various open licenses of the materials. Let me know if I can help provide modifications or different formats for these works, and I’m always happy to hear if people find them useful or not. Attributions: “CC TV Dinner” by Nate Angell is licensed under CC BY, and is a derivative of “tv dinner 1″ by adrigu (https://flic.kr/p/6AMLDF) used under CC BY, and various Creative Commons license buttons by Creative Commons (https://creativecommons.org/about/downloads) used under CC BY. Attributions: “CC Smoothie” by Nate Angell is licensed under CC BY, and is a derivative of “Strawberry Smoothie On Glass Jar” by Element5 (https://www.pexels.com/photo/strawberry-smoothie-on-glass-jar-775032/) in the public domain, and various Creative Commons license buttons by Creative Commons (https://creativecommons.org/about/downloads) used under CC BY. 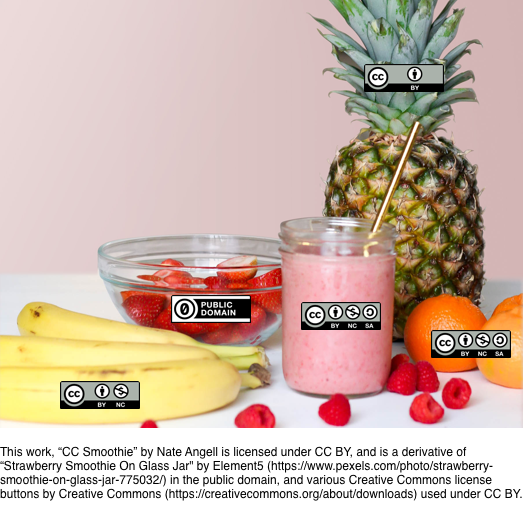 Attributions: “CC Smoothie” by Nate Angell is licensed under CC BY, and is a derivative of “Strawberry Smoothie On Glass Jar” by Element5 (https://www.pexels.com/photo/strawberry-smoothie-on-glass-jar-775032/) in the public domain, and various Creative Commons license buttons by Creative Commons (https://creativecommons.org/about/downloads) used under CC BY. 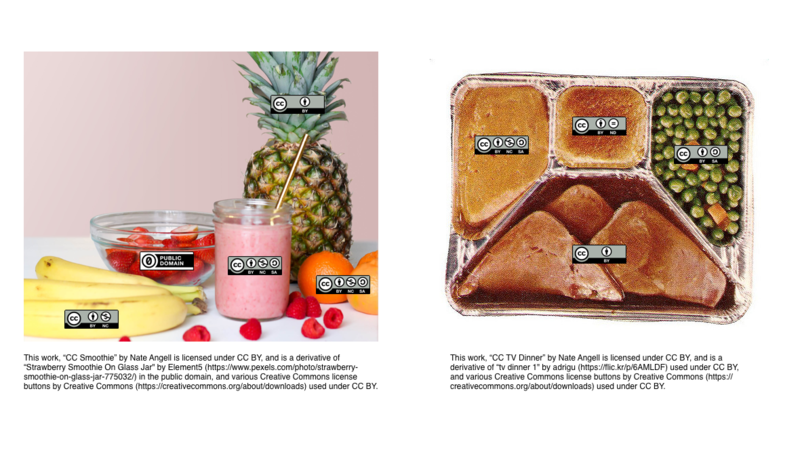 “CC TV Dinner” by Nate Angell is licensed under CC BY, and is a derivative of “tv dinner 1″ by adrigu (https://flic.kr/p/6AMLDF) used under CC BY, and various Creative Commons license buttons by Creative Commons (https://creativecommons.org/about/downloads) used under CC BY. As a consumer and maker of metaphors, my hat is off to you Nate for this one, and as well, the explicit act of showing person. Smoothies are definitely easy to make (especially with a Vitamix) but the ingredients documenting is absolutely easier if it’s something we just fold into our regular food/content making practice. Thanks Alan…this is what comes from lurking on the Creative Commons slack late at night.